Two CDs which raise important issues for 21st Century listening and collecting. First responses are likely to be that these composers are all from insignificant byways (the Bennett being W.S., not today's R.R.). Which one might be worth a hearing? Parry, perhaps - once thought the ‘greatest British composer since Purcell’ ? His Jerusalem is a great tune, and Blest Pair of Sirens remembered as an inspiring choral work. 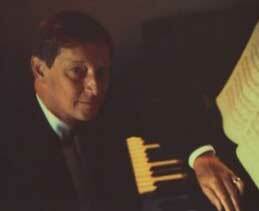 W T Best was the leading organ recitalist of his day, almost totally forgotten otherwise. And Czerny, perpetrator of the hundreds of piano studies that tortured us in our youth, the School of Velocity his Op 299, leading toward the Complete Theoretical and Practical Pianoforte School, Op.500 !!! Best forgotten? Exploring neglected repertoire is a worthy change (for reviewers) than assessing re-recording after re-recording of the canonic classics which fill the catalogues, generation after generation. How much do we need new Beethoven cycles? One reviewer says of Schiff's "intellectually rigorous and extremely careful about structure" cycle that it is "the most distinguished and certainly the most thoughtful survey of the 32 sonatas since Richard Goode's set in the early 1990s". Well, I have that, and Barenboim's and most of Schnabel's; enough, surely? So all praise to these two pianists. 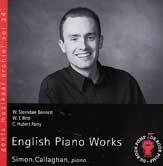 Unfortunately, despite best advocacy, the English Piano Works selected [De Rode Pomp Vol 34] do not really come to life for me under the hands of Simon Callaghan, who I look forward to hearing again in more worth-while repertoire, of which so much remains to be unearthed and given another chance in the limelight. For now, let's just admire and celebrate Callaghan for ensuring against the odds the continuity of London's venerable Conway Hall Sunday Concerts. But the prolific workaholic Carl Czerny (1791-1857), as advocated by Malcolm MacDonald and Martin Jones, is altogether something else. 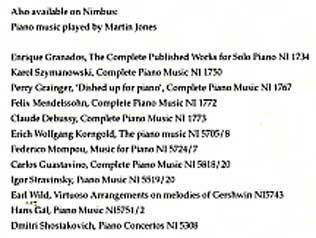 Indeed, the Nimbus Carl Czerny Piano Sonatas series, of which Volume One is now released, bids fair to become one of the most important piano rediscoveries of the decade. This twofer has captivated us. 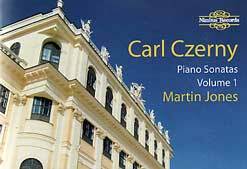 It is such a pleasure to listen to fine music not knowing what is to come, and Czerny surprises again and again. Whilst I personally should have preferred a period piano (Li-Chun Su thrilled us recently with Czerny on Bosendorfer and a Brodmann fortepiano) Jones finds exactly the right style and touch on Wyastone's Steinway Model-D to bring the music into mainstream, which many collectors will prefer. The four sonatas chosen to lauch the project are varied, from the gentle, lyrical Eb Op 144 to the 6 (or 7) movements no 6 in D minor of 1827, a massive work of 50 mins duration. There is a delightful fill-up, a romantic Nocturne Op. 647 of c.1840. Czerny was a misunderstood phenomenon, often unfairly dismissed on account of his pedagogical work as an empty composer whose music is without expressive substance. And maybe Martin Jones is taken for granted and underrated too; thought of as a Nimbus "house pianist" who has recorded intégrales of anyone and everyone? He is comfortable in all periods and styles, and his recordings demonstrate a wide range of music, some of it not readily available elsewhere. Some of those collections are admirable, e.g. Spanish composers and Szymanowski. This one is a veritable treasure trove, and Calum MacDonald's enthusiasm and erudition (drawing on Randall Sheets' doctoral dissertation, the only thorough survey of these works) leaves you eager for Martin Jones' Czerny Vol 2.